We are excited to share the amazing journey of one of our alumna, Maddi Stevens (TTS15). 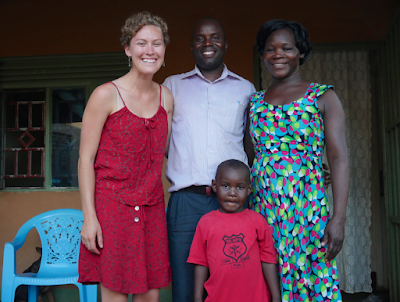 After spending a semester in Uganda with SIT, she recently graduated from Franklin University in Switzerland and has returned to Uganda to do some amazing work. Below is an excerpt from Maddi’s current blog, click here for the full selection. After a crowded, eight hour bus journey on the pothole-ridden road to Gulu, I found myself on the edge of my seat as we neared town, giddy with excitement. If I had felt at home even in Kampala, that familiarity paled in comparison to the sense of belonging I experienced returning to Acoliland. Every common detail — from the dense green fields to the peddlers selling groundnuts and mangoes, from the women pounding sim sim and drying cassava on the roadside to the eager children calling muno, muno! — contributed to my contentment at returning, finally, to Gulu. At the bus stop, I was met by the most welcome sight in the world: my beloved host mother Alice Aparo, beaming from ear to ear. She pulled me into a hug so fierce and warm and familiar, it seemed that no time at all had passed since our last meeting. Her brother also greeted me warmly as we picked my luggage to go home, ganga. Ganga Acoli (Me, Simon, Alice, and Jerry)! As ever, the neighborhood of Kasubi Bardege is an oasis. Everything seems to slow down in this corner of Gulu town, somehow becoming more peaceful, more settled. And for me, Alice’s home is at the heart of this haven. I can hardly describe my joy at being in this home again. The rhythms of it are so completely comfortable, the people so friendly, the food so scrumptious (mit mit moo) that I settle in contentedly without missing a step. Alice and I had some catching up to do before Jerry arrived from school and Simon Anywar from work. The other kids are still at school, and Aol Lucky has gone back to her village to help her mother, so I am missing them all desperately! Alice herself is currently pursuing a bachelor’s degree in Development Studies, and has just finished her second year exams, covering issues like population, conflict and mediation, economic development, etc. with a focus on current concerns in Northern Uganda. If possible, she is even more impressive now than before! Her food is also as good as I remember, and I am already leaping at opportunities to learn more Acoli cooking, with the side benefit of informal language lessons. Click here to see Maddi’s full blog.